I can hardly believe that a year has gone by since I wrote about my favourite people on Instagram to follow in 2015. This year I’ve sought the input from a number of bloggers, the lovely ladies that write for BTB. Our team of writers will be expanding in 2016 bringing you features and reviews about our favourite luxury, boutique and eco-chic hotels, glorious destinations and more. Here are our favourite Instagram accounts that we think you should be following in 2016. They are unsurprisingly mainly, but not all, focused on travel and we drew up this list with no regard whatsoever to the number of followers, these are simply accounts we love. A stylish journey around London and beyond with travel blogger, Julie, A Lady in London. Follow Julie on Instagram. Let Kash from the blog, Budget Traveller, show you how to travel in style on a budget. Follow Kash on Instagram. Simply stunning photography from Chris Burkard. Follow Chris on Instagram. Exciting and colourful images from the Expert Vagabond that will leave you with a lust for adventure. Follow Matthew on Instagram. Let travel blogger, Heather from Heather on her travels, take you on a cultural tour of the world with a smattering of hiking, food and a little luxury mixed in. Follow Heather on Instagram. 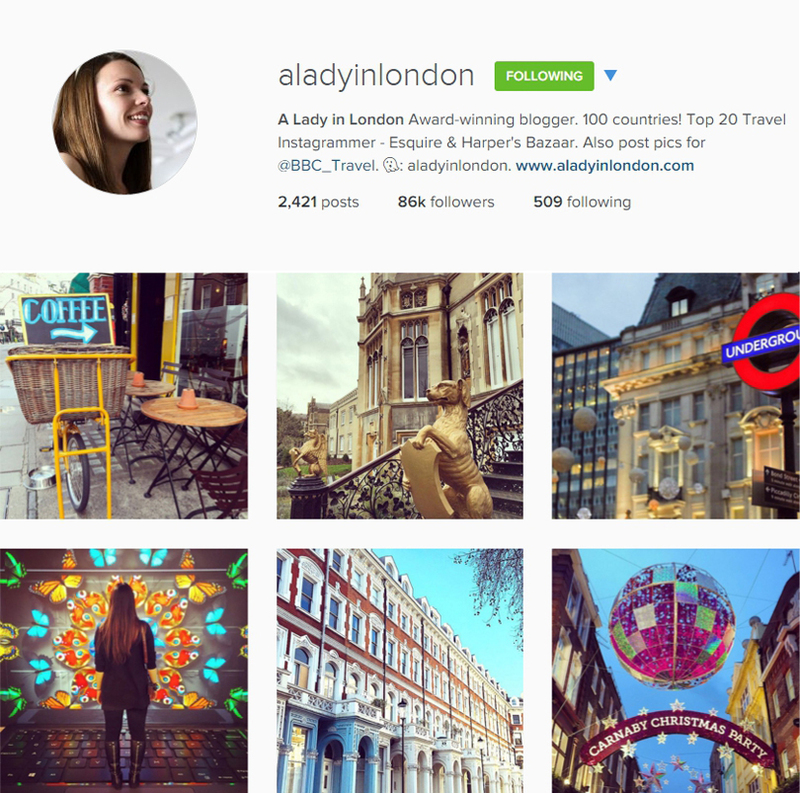 Stylish and inspiring, Abi’s blog, Inside the Travel Lab, is one of our favourites, as is her Instagram account. Follow Abi on Instagram. A delightfully delectable stream of tasty images guaranteed to make you hungry from Julie’s Kitchen. Follow Julie on Instagram. Julika is an Art historian and blogger based in Germany. She loves to travel through time as well as geographically and takes you along in her Sateless Suitcase. Follow Julika on Instagram. Travel blogger Lucy, from On the Luce, a lover of wine, travel and photography. Follow Lucy on Instagram. Stunning images that lead you on a global adventure. Discover more on Follow Me Traveller. Follow Murad on Instagram. Understated beautiful imagery from Paris In Four Months. Follow Carin on Instagram. Stunning images from a community of travellers each with a Passion Passport. Follow on Instagram. A beautiful stream of imagery that invites you into the world of photographer, Conor MacNeill, also known as the fella. Follow Conor on Instagram. Susanne, The Travelbunny, seeks to “inspire wanderlust and create culinary curiosity.” Follow Suzanne on Instagram. Travel With G, is a vibrant blog oozing with beautiful images from around the world. Follow G’s journey on Instagram and let your mind wander to far away places. Follow on Instagram. Our favourite restaurant on Instagram Two Hands NYC posts delectable images and occasional videos that will have you longing to move to New York just so that you can become a regular at their tables. Follow on Instagram. So that’s our favourite 16. We hope our selection has introduced you to some new and exciting people to follow of course we’d love it if you follow BTB on Instagram too. Our New Year’s resolution will be to post more images from our travels. Follow BTB on Instagram. And on a personal note I’d of course love it if you checked out my Instagrams as well, TravelWithKat. Thanks for including me! I’m honored to be in such good company! A very inspirational post indeed Kathryn! Lots of sumptuous photos here, and some names that I didn’t know before. Great post and people, need to go and follow some more! I’ve been traveling for the last few weeks, but just saw your Tweet sharing blogs to follow in 2016. I’m so honored you’ve included me! 🙂 I love and follow you blog, and will be following this one as well. Thanks! One of the team suggested you and I had to agree!